I still have to find a way to eliminate my wasteful habits when it comes to food and leftover ingredients. What kinds of ingredients do you buy that end up being thrown away because you forgot about them? Guilt gets the better of me when leftover ingredients turn green or collect mold and I have to chuck them. 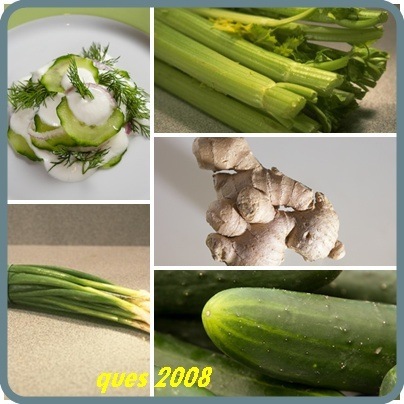 Onions and garlic are not a problem – I use them almost everyday, but these are the ingredients that spoil because of my negligence: celery, fresh herbs, ginger, scallions and cucumbers. I am less wasteful with cucumbers and scallions, but fresh herbs, celery and ginger are the ingredients that I tend to use once and forget to use again. Let’s take ginger. At times, I’m able to find small pieces so when they end up in the trash, I don’t feel as guilty. One day, the supermarket sold only large chunks and I was too embarrassed to ask the manager if he’d sell me only half (he would have booted me out of the store). Someone gave me advice about freezing fresh herbs, but I wasn’t sure I could do the same with ginger. So after using a small quantity, I wrapped it well in plastic and put it in a place in the fridge where I would notice it right away so I could use it again. 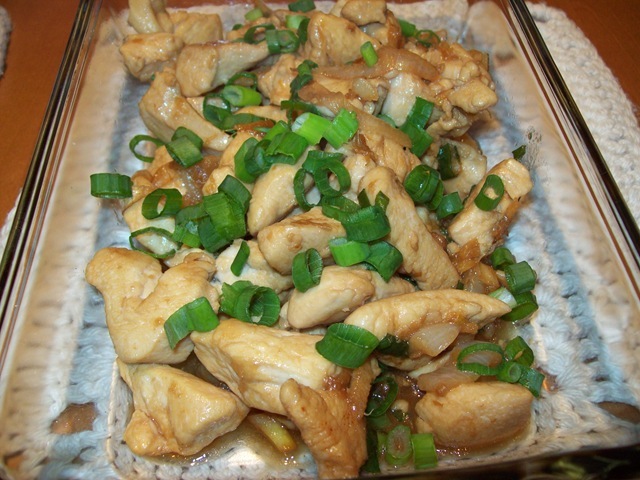 This chicken with ginger recipe that I found on the Net is a genuine “quickie.” I tried to retrieve the link but could no longer find it. All I remember is that it had the words “rec food recipes and Edoc” in the URL. This meal triggered fond memories of great meals served at Chinese restaurants (those were the days I ate out a lot because cooking was anathema to me). 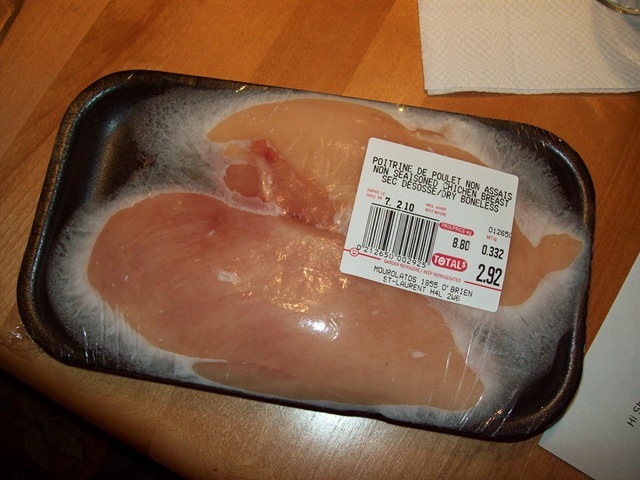 Supermarkets don’t sell one breast, you’d have to go to a special butcher shop for individual quantities, but this supermarket tray with 2 breasts should be enough for two people, with leftovers for a second meal. Cut chicken breasts into small bite-size pieces (about 3/4 inch in diameter). Heat oil in a skillet. Add onions and garlic and cook until onions turn golden brown. Add chicken pieces. Stir frequently to avoid the chicken from sticking. Cook until chicken is no longer pink. Blend ginger, soy sauce, vinegar and sugar. Add this mixture to the chicken. Cover and cook for 3-5 minutes (no harm in doing it for 5 minutes – you want to make sure that the chicken is well cooked). Stir in green onions. Serve with rice. Another tip: I thought that the sauce wasn’t enough so next time I will double the sauce quantity – adding more soy sauce and red wine vinegar. 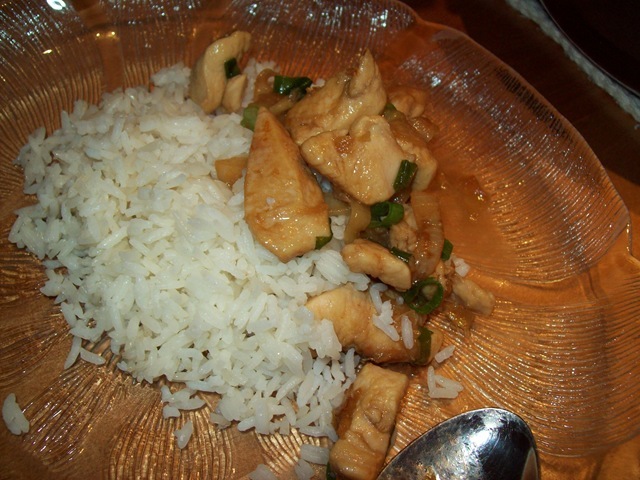 I would make sure though that the sauce does not overpower the taste of the chicken and ginger. This is a good meal, what I’d call a dish for all seasons. To add some creative flair, you could add chopped cashews and use red onion (or sprinkle sesame seeds on top before serving).